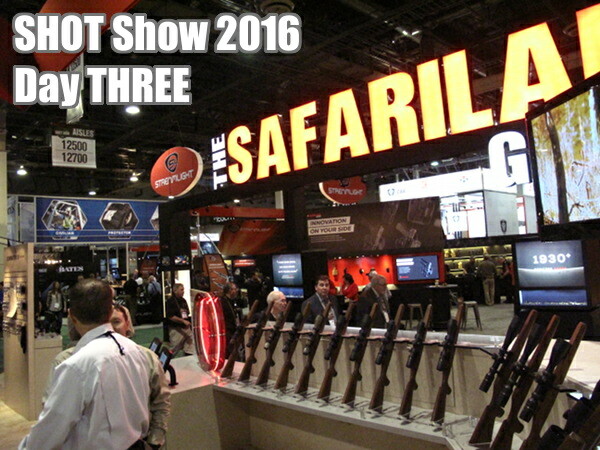 SHOT Show, the firearms industry trade show, is a huge event. There are more guns and shooting accessories than you can possibly imagine. On Thursday we saw everything from a giant CADEX .50 BMG with a 24″-long suppressor to a tiny Kahr .380, the thinnest carry gun in production. Here are some highlights from Day Three, a combination of old and very, very new. McMillan has a new, as-yet-unnamed tactical stock, Walther showcased an amazing electronic trigger, and Uberti revived America’s Wild West heritage with a line of single-action revolvers. CZ USA still continues to offer some of the best .22 LR rifles for cross-training and tactical rimfire games. The CZ 455 Varmint Tacticool and Varmint Precision Trainer (Camo) feature proper, full-size stocks (with adult-scale ergonomics) so these rimfires look and feel like a centerfire tactical rig. CZ 455s have smooth actions and crisp triggers. Look carefully — this Walther LG400 Alutec air rifle is different than any gun you’ve ever shot. You see it has an ELECTRONIC trigger. This sophisticated, battery-powered trigger offers a super-precise, super-light release (it’s more a “touch” than a “pull”). For top-level international and Olympic shooters, the electronic trigger can offer a competitive advantage. Later this year Walther will offer an electronic trigger in its top-of-the-line smallbore rifle. Kelly McMillan, president of McMillan Fiberglass Stocks is holding the latest tactical stock from McMillan. It features a girder-style open fore-end that fits any barrel contour. At the rear, the stock boasts an adjustable cheekpiece along with a straight toe for riding a sandbag. Interestingly, this stock has no name (as yet). At SHOT Show, McMillan is running a “Name This Stock” contest. The winner will receive a free stock. At its booth, Zeiss displayed what must be the world’s largest rifles-scope replica. This giant scope, as big as a totem pole, certainly did draw the attention of anyone who walked by. The big news at Zeiss this year is the Victory V8 line of scopes with 8X zoom ratio. We love vintage-style revolvers. This year Uberti offered a beautiful array of single-action pistols in a variety of styles. Along with its line of “Wild West” repro pistols, Uberti makes excellent lever guns based on classic Winchester designs. This editor owns two Uberti lever-action rifles, and they are both beauties. Our friend Steve Boelter, President of Anschutz North America, showed us the latest and greatest competition rifles from the respected German gun-maker. In this photo, Steve is holding the new Anschutz 9015 air rifle. Above is the new, top-of-the-line Anschutz smallbore target rifle. In a week or so we’ll release a video showing the details of both these rifles. It wouldn’t be SHOT without a few Booth Babes, or should we say Booth Babe-bushkas. These charming young ladies really ARE from Russia. Yuliya, on the right, hails from far-away Vladivostok in Siberia. She said she appreciated the warmer weather in Las Vegas. On display at the SAKO booth was the Tikka T3 Compact Tactical Rifle which has been adopted by the Canadian Rangers. This will replace the Ranger’s beloved, but antiquated Lee-Enfield rifles. The Canadian Rangers, an element of the Canadian Armed Forces (CAF) Reserve, serve as the CAF’s eyes and ears in sparsely-settled northern and coastal areas of Canada. The Rangers have helped secure Canada’s hinterlands since 1947. Browning showcased a series of large gun safes with much-enhanced fire-proofing and thicker steel walls. The new “Hell’s Canyon” Series of gun vaults offer 40% thicker steel plus 2 – 3 times the fire protection of typical gun safes. These “Hells Canyon”-series safes are impressive. We had a chance to interview shotgun superstar Kim Rhode, who has won Gold Medals at multiple Olympic Games. She told us some very interesting facts. For example, did you know that roughly 70% of females are left-eye dominant? Kim revealed some techniques that right-handed, cross-dominant shooters can use to improve their scores. We’ll reveal that in an upcoming video interview with Kim, shown here at the autograph table with some of her Olympic medals. Share the post "SHOT Show Day Three"
Great coverage Paul – much appreciated.